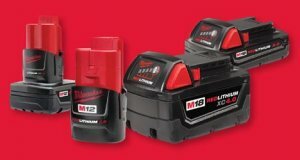 All of the signs pointed to the inevitable release of next generation of higher capacity batteries, and Milwaukee has made the announcement official today. Not only is the M18 line of tools getting a boost, but so does the M12 ultra compact class of tools. So what does this mean? In short, it means your tools can run longer with these new batteries. The compact batteries get an upgrade from 1.5 Ah up to 2.0 Ah and the XC4.0Ah batteries are an upgrade from the relatively new 3.0Ah batteries. Best of all, the batteries are still the same size as the previous RedLithium batteries. The new 2.0 and XC4.0 batteries promise to deliver 2x more recharges and 20% more power over standard Lithiun-ion batteries. The smaller capacity of 12V tools has been a major reason why I have not added these tools to my arsenal, but the extended run-times offered by these new batteries might have me changing my mind. Look for these new models to hit stores this winter.